It has been six days now since about 400 Canada Geese that had been living on the lake at Prospect Park, Brooklyn, were rounded up, packed two or three to a crate, trucked away, and gassed to death by the United States Department of Agriculture – all without public notice. This continues the trend in New York City, started last summer, of killing as many resident Canada Geese as possible, ostensibly to make aviation safer in the wake of the “Miracle on the Hudson.” Opinions have been running strong on both sides of the great goose killing debate and a post about the killings on the New York Times City Room blog garnered nearly 700 comments. This blog post, of course, will not decide the issue one way or the other. Personally, I am opposed to the mass killing of Canada Geese, not just because it is callous and cruel, but because it seems pointless. Even if the killings temporarily lower the population of Canada Geese it is only a matter of time before the population builds back up, necessitating another cull. Also, the local geese don’t seem to fly great distances or at great heights, so it doesn’t seem to me like they endanger planes. Instead, they usually make short flights from favored feeding grounds like Greenwood Cemetery to favored roosting spots like the Prospect Park Lake. It is migratory geese that were reportedly involved in the downing of flight 1549 that led to the “Miracle on the Hudson” and it is migratory geese that are not around at this time of year, breeding as they do in the arctic. Though I don’t know of any studies that have been done, my money is on local, “city-wise” geese knowing better than to get in the path of a jet while birds flying in from the far north might not know how to react when confronted by a giant steel missile moving at hundreds of miles per hour. Since 1999, The United States Department of Agriculture Wildlife Services agency has been engaged in lethal culls of Canada Geese primarily in urban or densely populated areas. The agency responds to municipalities or private land owners, such as golf courses, who find the geese obtrusive or object to their waste. After all, it might be difficult to convince the public of the need to kill geese because of poop but once one says that geese are threatening the lives of anyone who flies into or out of New York City, well, what kind of monster would be opposed to removing the threat? By the early 20th century, over-hunting and loss of habitat in the late 1800s and early 1900s had resulted in a serious decline in the numbers of this bird in its native range…With improved game laws and habitat recreation and preservation programs, their populations have recovered in most of their range, although some local populations, especially of the subspecies occidentalis, may still be declining. *Though, to be fair, a paper that I found on the USDA website indicate that bird-plane collisions are of serious concern to the USDA (link is a PDF). My only problem with this cull is the gassing of the birds; I’d have thought they could be dealt with in a way which left the meat usable. 1900 canada geese is a lot of meat which could’ve been used by local charities (or perhaps even sold to fund conservation projects) although I suspect overzealous food health laws make that unworkable (but I think birdchick tweeted the other day that they do this in Minnesota?). Much as I’d like the sort of animals that take canada goslings wandering our cities, it generally isn’t too likely (unfortunately) and they do cause a potential health problem and damage amenity/farm land. Control by egg removal would be a kinder option though I’d have thought. The fact that it is pointless is what makes it cruel and callous. If one decides to manage through killing (which should always be the last resort as you’re mostly fighting the symptoms, not the cause), it ought to be done in a way that has a positive and lasting effect. 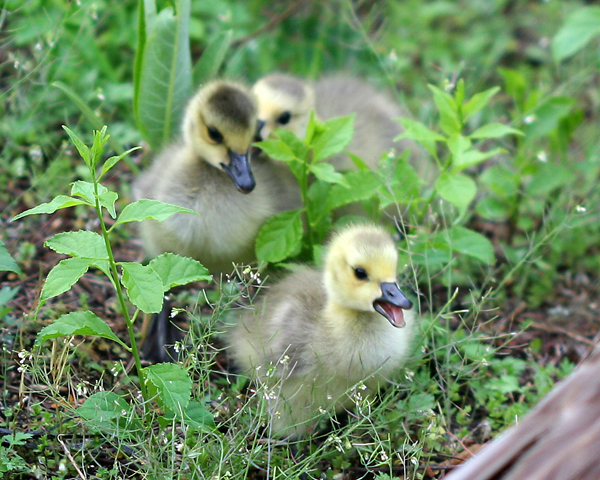 And did you notice, Corey, that by sheer and pure coincidence all your goose pics feature cute fluffy goslings? @tai haku: as a German I wholeheartedly agree – just the word “gassing” makes me sick, and they surely should use the meat if they mean to cull. Otherwise it’s a despicable waste of life. I also agree that there is a need to manage the populations at least locally, and that the re-introduction of predators is unlikely. However, it seems habitat management or the reduction of their food sources would seem more viable solutions than the killing of a certain amount of birds. This small-scale killing without eliminating the cause of their population growth isn’t going to change anything. Egg removal generally doesn’t work because the Geese just lay another clutch, but egg addling, where you coat the egg with an oily substance like cooking oil so that the embryo can’t breathe and the eggs never hatch, is a popular way of dealing with feral Geese around here. At least that’s what we do to the pair of Canada Geese that invariably try to nest at my museum every year. I tend to agree with Corey here regarding the distinction that needs to be made between feral geese than their migratory counterparts. Birders can help here by learning how to make that distiction in winter so that we gan get a better idea of where migratory versus non-migratory geese congregate. It seems like this is a project eBird could really help with. There is a category for feral Canada Geese, and if eBird reviewers make that option more widely available so that birders can enter the data we could potentially come up with a map that better monitors the two different groups of birds. Let me correct my statement, there is NOT currently an option for feral Canada Geese in the eBird filters. When the authorities act like this (rounding up and killing 400 geese without public notice or input) is it any wonder that individuals act like this? @Nate: it’s not always easy to distinguish between feral and migratory. While birding in Ann Arbor, I never thought that any geese within the city itself would be migratory – until I dicovered a few neck bands/rings in an urban flock on a very small pond of an industrial area that allowed close approach (typical feature of feral?? ), and learned that these geese had been banded at James Bay. And the fact that the same flock hosted a Cackling made it even more obvious. Oh, I agree Jochen. But there are certain times when we can be sure, for me I know the nesting flocks on my neighborhood pond are feral and the traditional wintering birds at the eastern Wildlife Refuges are migratory (made a bit easier when the migratory ones are the lesser subspecies too). Lumping them both as “Canada Goose”, however, seems oversimplified. eBird offers the same option for Mallards, migratory versus domestic type, so it’s definitely doable. I agree that the way this cull was done was abhorrent. I believe in the past, up north of the city, authorities have donated the carcasses to homeless shelters. Just because I have no clue … do NYC or other cities (save for Venice, Italy) go after pigeon populations in a similar manner? Both birds are viewed as pests by many people. Nate, how can a novice birder like me tell whether the flocks nesting nearby are migratory or permanent residents? Culling means thinning out not Wiping out. The lack of public awareness on what they were intending to do was pure crap. They took advantage of the birds while in their flightless stage, at night, goslings and all and exterminated them. Did they not explore other measures such as removing eggs over time and replacing with dummy eggs, herding with dogs from time to time? altering vegetation perhaps as to not make areas as enticing? appears not. I knew something was going on weeks ago as my house is in the flight path of the geese from PP to Greenwood Cemetery. They would fly like clockwork and for the last month or so the skies have been all but silent. Their actions are appalling. According to the full article on the subject, these geese were dumped in a landfill, but other culls have resulted in goose breast being donated to food pantries. I think that if they’re going to do culls, the meat should be used in some way. 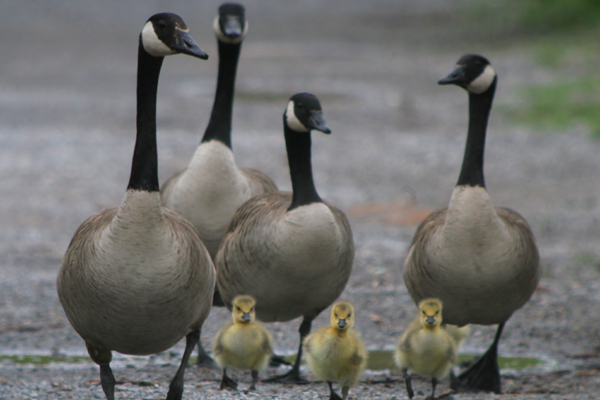 The migratory and non-migratory populations of Canada Geese are definitely distinct. I’m not sure I could tell them apart in the field however, except perhaps for some really small ones like B.c. parvipes. If I remember rightly, forensic tests tied the geese that brought down flight 1549 to the migratory population. If that is the case, it is hard to see the point in culling hundreds or thousands of residential geese. It is possible that it would be more difficult to get permission to cull migratory geese around New York, so resident geese seem like the next best thing to the USDA. In the summer, it’s pretty easy to tell feral from wild Canada Geese. In most of the country only feral ones are around from March to late September/early October. In winter it’s more difficult. In my state of North Carolina there are reliable wintering flocks of Canada Geese, typically the Lesser subspecies, in most of the eastern wildlife refuges. But feral populations elsewhere can include wild birds as Jochen mentioned and it can be hard, if not impossible, to tell the difference, especially between the feral birds, which are mostly the Greater subspecies and legitimately migratory Greater birds. The habitat, and the misguided people who feed junkfood to wild animals, will ensure that the geese will be back soon enough. Thank you so much for this very articulate response to the “cleansing” of the geese. I live right on Prospect Park, on the “unfavorable” side, so I know what it is like to feel like you are marginalized because you don’t look like a swan (or have rich or famous parents that entitled you to the privilege of living in Park Slope). I have gone running in the Park for years, and these geese knew me so well, they would not honk or even run away when I ran by. I am sure if they ever encountered an airplane they would not be so stupid as to run into it either. Where is the outrage? Some people on Facebook are saying they don’t “like” geese so it is “good.” Can you imagine if we wiped out any kind of species just because we didn’t like it? I thought we learned our lesson with humans, but apparently not with animals. Where’s the evidence that these particular birds hung out at one of the local airports? I fail to see what was accomplished by killing these 400 birds. Sounds more like they wanted to clean up the park. They kill innocent birds and insult the public’s intelligence by making up excuses. There will be a vigil held in honor of these birds at Prospect Park on Saturday, July 17th at 6:30pm near the Lake (Prospect park Southwest/Vanderbilt Street near the Gazebo) Please join us and pass the word!!!!! How terrible. If I still lived in NYC, I would be at the vigil. On my way to work everyday, I get excited because I pass this one house that has a flock of Canada Geese. The babies are getting really big. Sadly, they’ve been getting closer to the road and one did get hit the other day. I wonder if the owners are hapapy about the geese or think that they are a nusiance. I would be so exited if they were in my yard! I read the story in a local paper and was horrified. The geese are harmless and are definitely feral and not migratory. Anyone that could be responsible for this cowardly and despicable act is capable of murdering other innocent creations. How was this done without any Prospect Park offcial being notified? The lonely goose on the lake this morning was very telling of how any genocide is committed; with stealth – in the silence of the night – absolutely shameful! It’s just another case of someone in the media misrepresenting the facts to garner eyeballs. @duckyinfo: The geese at Prospect Park were rounded up, gassed, and buried. There is no denying that. You are referring to another issue, the statewide management plan, which is not mentioned here at all. Very sad…..I live in Queens and this is the first time I’m hearing about this!!! Can’t Mayor Bloomberg do something? And poop is food for the earth!!! !